Last year, I showed a video documenting how Ultra-Orthodox Jews in Israel were persecuting Messianic Jews by personally harassing and stalking Messianic Jews. This year, a state-wide teen Bible knowledge competition, initially promoted by rabbis, was soon boycotted by many rabbis as they found that one of the winners was a Messianic Jew. Also earlier this year, the Israeli Ministry of Interior was revoking the citizenship of Messianic Jews in Israel, forcing them to leave the country. In March of 2008, a young Messianic Jewish teen, Amiel Ortiz, son of a Messianic pastor, was critically injured as he opened up an exploding package delivered to their home. The blast of the bomb shattered the windows of their home and the nearby automobiles, sending nails and over 100 pieces of shrapnel to permeate the boy's body. Amazingly, if not miraculously, the boy remains alive. The security cameras which Amiel's father installed on their home after an anonymous firebombing last year caught a well-known Jewish extremist delivering the explosive package to their home. Today, CNN is reporting that Jewish students from the city of Or Yehuda, near Tel Aviv, rounded up New Testaments in the city and burned them en masse. The man responsible for organizing the students was Deputy Mayor of Or-Yehuda, Uzi Aharon. Uzi Aharon claims he did not intend to burn the New Testaments, he only meant to round them up to prevent missionizing in his city. Uzi Aharon is a member of the Shas political party in Israel, an Ultra-Orthodox party that currently holds several seats in the Israeli Knesset. Fortunately, many Conservative and Reform rabbis are condemning this New Testament burning. Derek Leman cites an excellent piece from a Conservative Jewish leader condemning the burnings. I do not write this to villify Orthodox Jews. So many Orthodox Jews are zealous for Torah and for God; I understand where Orthodox Jews are coming from. To them, a Messianic Jew is a Christian, a member of a religion foreign to Torah; an idolatrous religion. Becoming a Christian means abandoning Jewish identity, Jewish culture, Jewish religion -- even Hitler could not make Jews lose their Jewish identity; how much worse, then, is converting to Christianity! The reality of the matter, however, is not as the Orthodox Jews perceive it. Nor as the Christians perceive it, for that matter. The reality is that Messianic Judaism is not a Jewish flavor of Christianity. While alone I cannot speak for all, I can say that many see Christianity as a Roman-led departure from the Hebrew faith. While many beautiful things have come from the Christian religion, and while God has used it to bring 1/3rd of the whole gentile world to the God of Israel through the Messiah of Israel, we must still contrast Christianity with the Hebrew faith. The early believers in Y'shua as the Moshaich of Yisrael were initially known as Nazarenes, members of the Way community of Jews; they were not part of a new religion. Indeed, they kept the Torah as any God-fearing person ought to, received instruction at Beit HaMikdash (Temple), and were standing members in the Jewish community. What happened in 325 CE was the official creation of a new state religion, and what came out of that has become what we know as Christianity today. This Roman religion in numerous ways is a departure from the Hebrew faith. It is indeed idolatrous in its praying to saints, in praying to Messiah's mother, in its claims of an infallible human being elected by the College of Cardinals, in its replacing Israel with an unclean people, in its replacement of God's Feasts with holidays of pagan origin, and most of all, its rejection of Torah. When Constantine severed the Hebrew origins of this faith in Messiah, a new religion was officially created. It is this religion that Orthodox Jews fear their relatives and friends becoming members of. Many Orthodox Jews are zealous for God and do not wish to see Jewish folks severing their Jewish culture, identity, religion. It is with earnest conviction I say that Messianic faith does not wish a loss of Jewish culture, a loss Jewish identity, especially not a loss of Jewish religion. There is no need to be baptized into Christianity. (Indeed, if one is already following Torah, a regular mikvah for outward cleansing is already prescribed!) There is no need to go to a Christian Church. There is no need to convert. Messianic faith requires one thing alone: faith in Messiah. Trust that the Jew from Natzeret, Y'shua ben Yosef, is the Moshiach foretold by the prophets in the Tenakh. As Rabbi Hallel once said, "Everything else is details." I do not excuse this persecution by the Orthodox. One must not confuse understanding for agreement. Unfortunately, I suspect that the Orthodox will not see Messiah until he reveals himself in the flesh, again. Perhaps this time around, it will be the gentiles, with their idolatrous religion, who stumble on the stone laid in Tziyon. Or perhaps God's plan is that Jews and gentiles alike will finally be united in their faith in the God of Israel through Messiah. At this time, however, it looks like many Christians will refuse to give up ties to the idolatry in their religion and that will be their stumbling block, just as it was for many of the devout Jews in Messiah's day. We will see. Whatever the plan, I hope we see it come to fruition in our day, and soon; things sure are heating up down here on planet earth. Father help us. I agree that things are heating up. On the positive side of that, I have become hungrier for God than I have ever been in my life. I am seeing more and more Christians pursuing unity amongs Christians and Jews as well as a desire to tear down denominational walls. It blesses me so much. I have also seen more "ordinary" people begin to take an active role in going to the nations to spread the gospel. He is returning soon! Hey Haley, thanks for the comment and the encouraging words. Gary, you're right, the early believers in Messiah faced this persecution from Jewish religious leaders. My point wasn't that they faced no persecution, but that they remained Jews, there was no "asking Jesus into their heart", no salvation prayer, no going to church on Sunday. There was not a new religion with a steeple on the top of the building. I see where you are coming from. I guess the point I am trying to make that there have been evil men persecuting Christ's church since it's inception at Pentecost. Those men, especially the religious, try to rationalize their behavior even to the point of claiming they have acted righteously in persecution. Those rationalizations, even the one expressing fear of lost identity, are a smoke screen; the bottom line is that they are evil men who are acting the part. Gotcha. At the end of the post I said, "understanding should not be confused with agreement", that is to say, while I understand where this persecution is rooted in and how it is rationalized, this persecution is wrong." I'm reminded of a Christian dinner at which a new Jewish convert attended. The main course? Pig. As the Jew looked crookedly at the unclean animal on his plate, a Christian guy said encouraginly, "Don't worry, we're all free in Jesus now." This is the same religion that replaced God's feasts with man's ugly inventions. If that is the religion Jews are converting to, then I do not wish them to be members of that religion. That is why we must distinguish between Messianic faith and the Roman-led departure from the Hebrew faith which is the Roman Catholic Church and her Protestant offspring. It never ceases to amaze me how religious folk are so easily offended but then again, religion needs defending because it could be crushed from the outside by persecution or from the inside by heretics. That's why I put my faith in a person, Jesus Christ. No matter how much persecution from without or heresay from within, Jesus will never fade away. Shalom! The burning of Brit Hadashas or N.T. is something that will backfire in the long run. 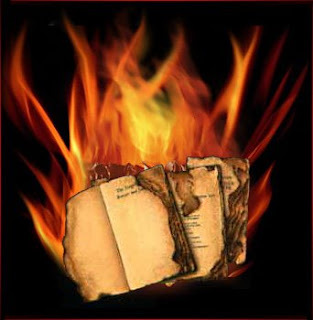 People will start asking why the burning of these books, and what do these books contain? The restauration of Israel demands all of these situations. When "orthodox" Jews persecute those who believe in Brit Hadashah and not in Talmud, people will realize that these "orthodox" rabbis are hiding something from them. Thousands of Israelis will come to Moshiach very soon, and "orthodox" will become a minority and their rituals and ceremonies will be something of the past. Real Yahudim are messianics! "At this time, however, it looks like many Christians will refuse to give up ties to the idolatry in their religion and that will be their stumbling block, just as it was for many of the devout Jews in Messiah's day." As a gentile believer, I did just that by celebraring the Shabbat and 7 feasts. When I went to celebrate Christmas in 2007, I felt such a difference between celebrating Passover and Christmas. Passover the focus was on God. Christmas, I am sad to have to say this it was so empty and felt that God was not the focus even though Christmas Carols played on the radio. I can't explain it but there was a difference. The feasts are God centered and I look forward to it...like a date to meet with the Lord is the best way to describe the experience. That's terrible! The evil spirit of persecution has been going on since Cain killed Abel, and doesn't seem to have any national or denominational boundaries. I'm a unitarian Christian - God is One and Jesus Messiah is His Son, I don't suppose the ultra-orthodox Jews would see that as Christianity more in line with Jewish belief and therefore not such a threat to Jewish identity? I kind of don't think so. RE: Gary Kirkham said.....I see where you are coming from. I guess the point I am trying to make that there have been evil men persecuting Christ's church since it's inception at Pentecost. Actually, the persecution was happening from BOTH sides, from the Jews and the Roman Catholic Church. Also, as far as when "Christ's Church" came into being, check back in the Old Testament and you will find more references made to "The Church" or Ecclesia as it is known in Greek, than you will find in the New Testament. The Church did not start at Pentecost, just the outpouring of the Holy Spirit which is a second giving of the Torah like as to what was given at Mt. Sinai to Moses and Israel. Download the Inter-Linear Scripture Analyzer (free) and you will get a shock at how much of what is said in the New Testament actually came from the Old Testament.